Prince Charles meets Nigerian navy. 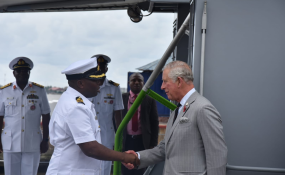 The Nigerian Navy has hosted the Prince of Wales in Lagos on Wednesday in continuation of his three-day business and cultural tour of Nigeria. The News Agency of Nigeria (NAN) reports that the prince, who arrived the Naval Dockyard in Victoria Island at 1:46 p.m., was received by the Chief of Naval Staff, Ibok-Ete Ibas. After being ceremonially received by the Naval chief, the prince was taken on a tour around Lagos waters on the Nigerian Navy Ship (NNS) EKULU. Speaking with journalists after the departure of the prince, Mr Ibas said that the visit was an encouragement for the navy. "The Nigerian Navy is an offshoot of the Royal Navy and he is also here to see by himself the progress being made with the cooperative support the royal navy has been giving Nigeria," he said. NAN reports that Prince Charles and his entourage had earlier arrived Lagos aboard a B737 aircraft with registration number CS-TFY, which landed at the Presidential Wing of the Murtala Muhammed Airport at 12.08 p.m. The prince's three-day business and cultural tour of Nigeria is also to mark the 75th Anniversary of the British Council in Nigeria. The prince also met with notable traditional rulers as part of efforts to build peace in the Middle Belt and other parts of the country.